I’ve been sitting on this little expansion for Tuesday Night Tanks for far too long. I’m extremely satisfied with the product that I’ve been able to release with the help of thegamecrafter.com. The only thing I’ve viewed as a downside in this entire project has been the lack of 3D buildings. Everything else in the game uses tokens to represent the objects in the physical world of TNT while the buildings are just 2D drawings on a board. I could have tried harder to design around the components available, but decided that I really wanted the buildings to be a part of the TNT lore. Today, I am releasing a micro-expansion for Tuesday Night Tanks: Buildings. This expansion is nothing more than 18 papercraft buildings for use with the base game. You’ll need to cut and assemble some seriously tiny buildings, but the results are worth the effort. I’m quite proud of them. You can head to thegamecrafter.com to purchase your own copy of Tuesday Night Tanks and/or the Buildings expansion. 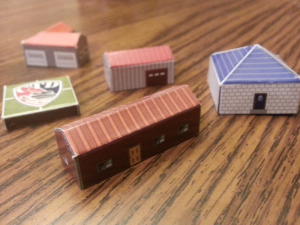 If you already own TNT or you would simply like to have some tiny papercraft buildings, I’m also providing the files for free here on the main Tuesday Night Tanks page! Print ’em, cut ’em, glue ’em, and let’s play some tanks!